We are becoming more and more used to the idea of new technology being embedded, into our everyday lives and activities. Marshall McLuhan believes that we treat “technologies as extended bodily organs.” (Durham Peters) We are continuously experimenting with innovated technology, that can help improve our lives and the search for knowledge. However, this does come with a compromise and that is the safety and privacy of the user. The more advanced technology gets; the more effortlessly biometric data can be collected. Facebook has been notorious for how they handle their user’s information and does not have the best track record regarding, the protection of user’s privacy. Therefore, when they announced earlier this year, that they are introducing augmented reality technology to its advertisements, questions regarding its potential for surveillance issues and data harvesting emerged. The premise is to transform Facebook ads into interactive AR experiences. Ty Ahmad-Taylor, vice president of product marketing for Facebook, exhibited how AR can be used to try on advertised products, such as virtual sunglasses, hats, and even makeup. You can also see advertisements from furniture stores, which lets you experience how the product would look in your room, before buying it. This all sounds very handy, easy and carefree, as Ahmad-Taylor also introduced the ‘tap to online store’ an invisible infrastructure, where you can buy the product(s) you liked. (Ha) By implicating this technology to Facebook, it creates a wide platform for data collection and is very effective, as a targeting mechanism. Vladan Joler and Andrej Petrovski found that with the data stored in the ‘action store’, Facebook can determine very specific aspects of your life. Such as where you work, which gym you go to, your income, recorded audio, behavioral patterns and many more revealing and personal facts. Including “every message you’ve sent or been sent”. (Curran)Mark Zuckerberg said himself, that the reason “Facebook works” (Joler, and Petrovski)is because of the social graph, which collects every piece of juicy information from the users, both inside and outside of Facebook. “When you like some picture on Facebook, a connection <like> is created between the two objects, you <userID>and photo <photoID>.” (Joler, and Petrovski)So the more you engage and share, the richer the data will be. Facebook then exchanges this data with “data dealers, data and market analysis companies” (Joler, and Petrovski)and hundreds more, whom can use this action data analysis and content analysis, to make more precise targeted advertisements for consumers. The use of AR technology only amplifies the amount of biometric data that can be collected, as they now have access to your voice print, hand and face geometry, as well as your inanimate surroundings. (Klaris, and Bedat)One of the main features that the AR technology will promote, is facial recognition. The feature analyses a series of invisible dots in order to create an accurate and exceptional depth map of the users face, which can be used for comparison with existing data. (Davey)The app or program cannot only link your face to your social media profiles and identity, but it can also detect, where you are looking, for how long, how you are feeling. For example, do you smile when in contact with the commodity and so on. As B.J.Fogg expresses; friction or resistance in our lives cause stress; (Fogg) so we let ourselves be observed as it comes with benefits. But the question is; to what extent should we let convenience come before our security and privacy? Is constant monitoring what the future holds? And what impact will this have on our social self and social media self? Curran, Dylan. “Are You Ready? This Is All The Data Facebook And Google Have On You | Dylan Curran”. The Guardian, 2018, https://www.theguardian.com/commentisfree/2018/mar/28/all-the-data-facebook-google-has-on-you-privacy. Accessed 19 Sept 2018. Davey, Lizzie. “Facial Recognition Technology And What It Means For Data Privacy And Protection”. Medium, 2018, https://medium.com/@AxelUnlimited/facial-recognition-technology-and-what-it-means-for-data-privacy-and-protection-fe232847220d. Accessed 19 Sept 2018. Dickson, Ben. “The Security And Privacy Risks Of Face Recognition Authentication”. Techtalks, 2017, https://bdtechtalks.com/2017/10/21/face-recognition-faceid-security-privacy-concerns/. Accessed 20 Sept 2018. Durham Peters, John. The Marvelous Clouds- Toward A Philosophy Of Elemental Media. 1st ed., The University Of Chicago Press, 2015, p. 16. Fogg, Brian J. Persuasive Technology – Using Computers To Change What We Think And Do. Morgan Kaufmann, 2003. Ha, Anthony. “Facebook Is Testing Augmented Reality Ads In The News Feed”. 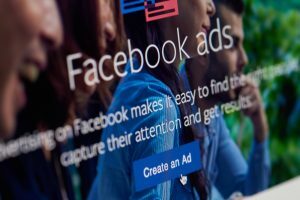 Techcrunch, 2018, https://techcrunch.com/2018/07/10/facebook-ar-ads/. Accessed 18 Sept 2018. Joler, Vladan, and Andrej Petrovski. “Facebook Algorithmic Factory”. Vol 1, 2, 3, 2016, https://labs.rs/en/. Accessed 16 Sept 2018. Klaris, Ed, and Alexia Bedat. “M&E Journal: The Biometric Data Concerns Around Virtual And Augmented Reality Applications”. Mesalliance.Org, 2018, https://www.mesalliance.org/2018/08/08/me-journal-the-biometric-data-concerns-around-virtual-and-augmented-reality-applications/. Accessed 22 Sept 2018. Larsen, Luke. “Facebook Wants To Own Your Face. Here’S Why That’S A Privacy Disaster”. Digital Trends, 2018, https://www.digitaltrends.com/computing/facebook-facial-recognition-privacy/. Accessed 17 Sept 2018. Mattern, Shannon. “Infrastructural Tourism”. Places Journal, no. 2013, 2013. Places Journal, doi:10.22269/130701. Salehan, Mohammad, and Arash Negahban. “Social Networking On Smartphones: When Mobile Phones Become Addictive”. Computers In Human Behavior, vol 29, no. 6, 2013, pp. 2632-2639. Elsevier BV, doi:10.1016/j.chb.2013.07.003. Accessed 23 Sept 2018. The Statistics Portal. “Facebook Users Worldwide 2018 | Statista”. Statista, 2018, https://www.statista.com/statistics/264810/number-of-monthly-active-facebook-users-worldwide/. Accessed 16 Sept 2018. Wassom, Brian D. Augmented Reality Law, Privacy, And Ethics. 1st ed., Elsevier, 2015. Facebook. “Try On” VR Advertisement Experience. 2018, https://www.engadget.com/2018/07/10/facebook-ar-ads/. Accessed 21 Sept 2018. Pottery Barn, Facebook. Pottery Barn’s 3D Room View App. 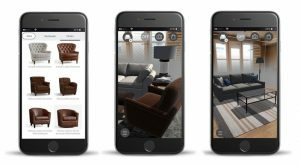 2017, https://www.homeworldbusiness.com/pottery-barn-advances-augmented-reality-app/. Accessed 22 Sept 2018. SocialFly. Advertisement On Facebook. 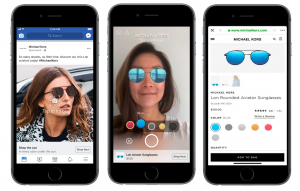 2018, https://www.socialflyny.com/four-things-you-need-to-know-about-facebook-augmented-reality-ads/. Accessed 22 Sept 2018. Goodbye Cashiers. Goodbye Checkouts. Goodbye Privacy?